Bimal K. Bose, "Power Electronics and Variable Frequency Drives: Technology and Applications"
This original contributed volume combines the individual expertise of eleven world-renowned professionals to provide comprehensive, authoritative coverage of state-of-the-art power electronics and AC drive technology. 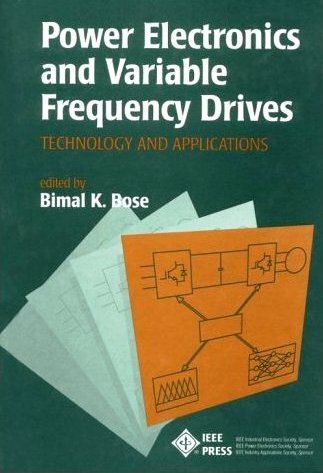 Featuring an extensive introductory chapter by power-electronics expert Bimal K. Bose and more than 400 figures, POWER ELECTRONICS AND VARIABLE FREQUENCY DRIVES covers each of the field's component disciplines and drives--all in one complete resource. Broad in scope and unique in its presentation, this volume belongs on the bookshelf of every industry engineer, professor, graduate student, and researcher involved in this fast-growing multidisciplinary field. It is an essential for teaching, research, development, and design.